By the time the race started the rain had been falling for several hours and thoughts of slippery mud filled my head. I was looking forward to running in these conditions, so I was very excited. The first lap was down right fun….muddy but still very manageable, and I was able to hold a steady pace that I felt confident I could maintain. By the second lap the course was really getting chewed up and I was having to use alot more energy than I wanted to, still I was having a blast. 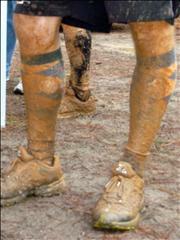 I was having to adjust my my running style by pointing my toes down when I entered the deep mud. I seemed to be getting a fan club by the second lap and this really helped me to push through my first wall at mile 30. By mile 40 I was feeling no pain and was greeted by Leigh (a friend and pacer for me at the Pinhoti 100) at the start/finish aid station. It was a complete surprise but it made my smile even bigger, and she brought hot chicken soup…!!! I started lap 3 feeling good but any thoughts of me maintaining my pace were out the window, my original goal was to first finish and second finish sub 22 hours. It was now all about surviving the course..!!! The rain had been falling steady to hard for almost the entire race and I was covered in mud and soaked to the bone. I was having trouble running even the slightest uphill due to the mud, and one of the creek crossings was about knee deep now and still rising. The field was thinnig out so I was running mostly by myself, so every aid station was a blessing. It was great to see all those smiling faces and hear all the encouraging words from the volunteers. This race had some of the best volunteers ever…Thanks guys without you there would be no race..!!!! When the darkness finally over took me I was on my 4th lap so I felt confident that I wouldn’t have any trouble following the course,… WRONG. Just after aid stion 1 the rain and the fog kicked in and I (along with several other runners) missed a turn off. I almost ran all the way back to the aid station via a dirt road before I finally stopped and turned around. I was starting to become hypothermic so it took me a long tme to realize I missed the turn off and should turn around. I didn’t have any trouble spotting the turn off after I turned around, but I ran about 4 extra miles… 😦 I knew that once I got back to the start/finish aid station I would pick up Susan (my pacer, thanks to Kim) for the last 27 miles. By the time I got to the aid station I was in bad shape, freezing cold, shaking, and in desperate need of a shoe change. I have no idea how long it took me to change my shirt and shoes but it had to be close to 20 minutes or so. I was unable to untie my shoe laces and most of my motor skills were failing do to being extremely cold. I can’t imagine what Susan was thinking as she watched me struggle. I warmed up on the 7 mile section of the 4th loop, but lap 5 was a complete killer for me…!!! I was in complete survival mode, up to this point the GRR had been the most exhausting race I had ever run and I still had 20 miles to go… Susan knew that I was struggling so she kept talking to me and helped to keep my mind off of the pain. The 13 mile stretch seemed as if it would never end, but it did. At the start/finish line I was greeted by friendly faces and words of encouragement. Tony told me that there had only been 1 finisher and that I was currently in 3rd place. All I had to do was gut out another 7 miles and it all would be over. Susan and I slogged our way through the deep mud and up the ridiculously steep hill one last time before reacting the last aid station. Only 3 miles to go, this gave me one last surge of energy and carried me to the finish… This was one tough and exhausting race, but I had a blast. I started the race with a smile and finished it with the same if not a bigger smile….!!!!! A huge THANK-YOU goes out to all of the great GUTS volunteers and to Tony for putting on such an excellent race. Kim you are the best, thank-you for hooking me up with Susan as a pacer and for believing in me. And to Susan, you are the reason I was able to keep on pushing, thank-you for sticking with me those last 27 miles, and for making me laugh when all I wanted to do was cry.